Are Hanwell's Heritage Lampposts Coming To a Street Near You? "Council May Be Allowing £500,000 to Slip Through its Fingers"
Angry Hanwell residents are up in arms at Ealing Council’s plans to remove original antique streetlighting from one conservation area and transfer them to Ealing's recently announced 'heritage quarter'. As part of a PFI agreement to upgrade streetlighting across the Borough, Ealing Council intend to remove 55 of the original Victorian and Edwardian lampposts from four roads in the Hanwell Village Green Conservation Area, refurbish them, and install them elsewhere. "These lampposts have been here since the houses were built during the period stretching from the 1880s to 1912 and are part of our heritage," said Philip Jackson, a local resident known to many as Agatha Christie’s Inspector Japp to David Suchet’s Poirot. 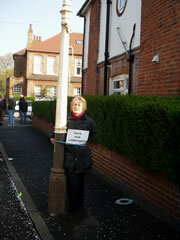 Residents say that they have not been consulted by Ealing Council onthe question of removing the street lamps. However the Council claims that the decision to upgrade the lighting and replace the original lampposts was taken by the previous administration, and that a consultation was undertaken at the time. "The previous Labour administration made the decision to remove all heritage street lighting as part of the PFI Streetlighting renewal programme," Leader of Ealing Council Jason Stacey. "It is not true to say that no consultation was carried out. Indeed in the early stages of the PFI contract being put together consultation was carried out with residents on conservation panels, including those covering Hanwell. "The Council is being disingenuous about the so-called consultation," said Peter Chadburn,a resident in Campbell Road, near the Grade II listed Hanwell Railway Station. “Four years ago, the previous administration consulted with some, but not all of the Borough’s Conservation Panels that represent local residents on conservation issues. At the time it was thought that the original lampposts could not be brought up to EU standards. This has subsequently been found to be incorrect. There are 350 households in this area and we have not been able to find anyone who recalls being consulted by this administration and given the option to retain our antique lampposts rather than having the modern ‘heritage style’, or standard ‘hockey stick-style’ imposed upon us,” he continued. “The lampposts have not been discussed in detail at any of the Hanwell Area Committee meetings; and claims to residents by Jason Stacey, Leader of Ealing Council that the issue has been aired in the local newspapers are totally irrelevant,” he stated. “It is ridiculous to expect everyone to read the local papers every week on the off-chance they publish this kind of important information from the Council. We want to be consulted properly and fairly, and to keep our original lampposts, but we are being treated like second class citizens in our own borough because they are being refurbished and sent somewhere else," he concluded. Save Ealing’s Antique Lampposts (SEAL) has won a hard fought campaign to keep the antique lampposts in South Ealing and Northfields, newly designated a ‘Heritage Quarter’ - the area to which Hanwell’s remaining original lampposts are set to go. But Arthur Breens, a founder member of SEAL, says he doesn't want their area to benefit at the expense of other roads in the Borough worthy of conservation. “The area around the Station is one of the oldest in Hanwell. I fully understand that residents in these streets want to keep their original antique lampposts. I have driven around the area and can see exactly what they mean. I feel sure the 55 posts at issue would not be essential to infill our heritage area,” he asserted. So what makes the heritage quarter more deserving than Hanwell? "As a council we do want to preserve something of our past but we also have to recognise that there are a finite number of these columns left in the borough and some are simply no longer fit for purpose," explained Mr Stacey. "From discussions this led to the creation of the Heritage Quarter concept. Focussed around the Ealing Studios for which the borough is renowned worldwide, it enables the council to create an area, close to the borough's main attractions, which can properly replicate the heritage of our borough. On behalf of the residents, Philip Jackson is calling for Jason Stacey to halt the planned removal of the lampposts to, "allow for the correct facts to be presented to the people affected, in a proper consultation, and for an equitable resolution to be found".